The California State Flower, the California Poppy's golden blooms were chosen as a fitting symbol for the Golden State. California poppy leaves were used medicinally by Native Americans. There's nothing more delightful than the Red California Poppy. The California Poppy is drought-tolerant, self-seeding, and easy to grow in gardens. 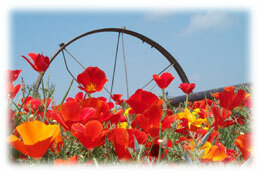 While an annual, the California Poppy will re-seed itself year after year. 8-12" tall. Last year, we produced and sold 25 tons of California Poppy in packets, mixtures, to highway departments, landscape contractors, schools, stores and even the Rotary Club!